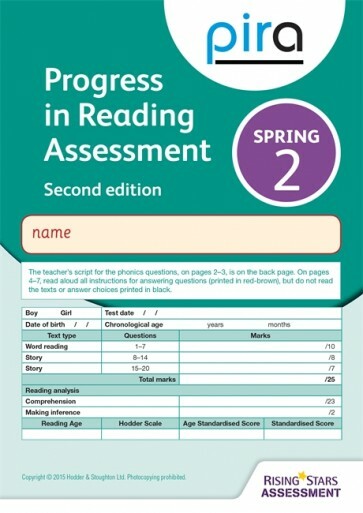 Updated for the new curriculum, this new edition of PiRA (Progress in Reading Assessment) enables schools to assess, monitor and predict pupil progress in reading across the primary years. These termly tests will give standardised results and age related scores that will enable schools to track pupil progress term by term. They will also provide reliable diagnostic and predictive information to support and guide effective classroom learning. Full coverage of the new National Curriculum - supporting a whole-school approach from spring term in Reception to the end of Year 6. Provides a diagnostic profile for each pupil - including a Standardised Score, Reading Age and Hodder Scale Score, based on the termly performance of over 10,000 pupils nationally. Helps monitor small increments of progress - offering a reliable basis for predicting future progress and supporting planning. Supports the identification of strengths and weaknesses - informing teaching and highlighting areas where children may need more support. Simple and quick to administer and mark - taking just 30 to 40 minutes to assess a whole class.